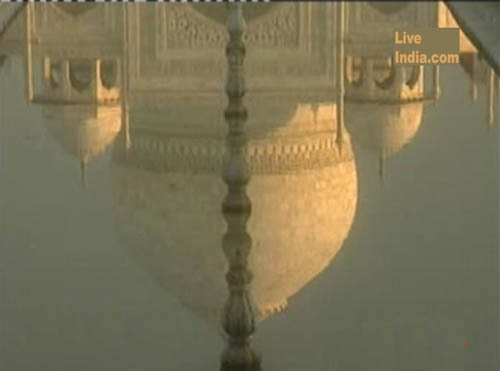 beauty of the immortal Taj. 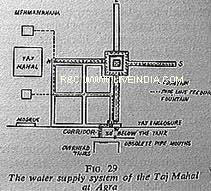 The architect who was fully aware of the unaesthetic appearance of the coarse pur-ramps and crude conduits, designed a clever system to procure water for the Taj through underground pipes. 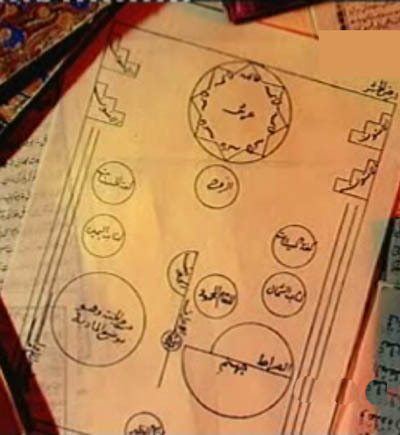 Water was drawn from the river by a series of purs (manual system of drawing water from a water body using a rope and bucket pulled by bullocks) and was brought through a broad water channel into an oblong storage tank of great dimensions. It was again raised by a series of thirteen purs worked by bullocks. Except for the ramps, the other features of the whole water system have survived. An over-head water channel supported on massive arches carried water into another storage tank of still greater dimensions. Water was finally raised with the help of of fourteen purs and passed into a channel which filled three supply tanks, the last of which had pipe mouths openings in its eastern wall. The pipes descended below and after flowing underground crossed into the Taj enclosure. One pipe line runs directly towards the mosque to supply the fountains in the tanks on the red sandstone plinth below the marble structure. 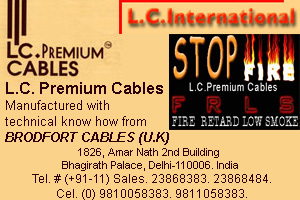 Copper pipes were used for separate series of fountains in the north-south canal, lotus pond and the canal surroundig it. 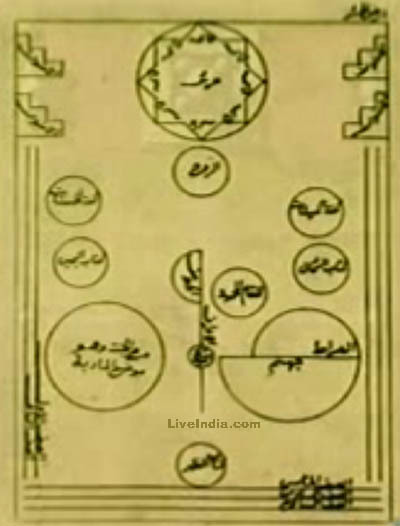 Tajmahal Layout An ingenious method was devised to ensure uniform and undiminished water pressure in the fountains, inspite of the distance and the outflow of water. The fountain pipes were not connected directly with the copper pipes feeding them to avoid a gradual decrease in the volume and pressure of the water. Instead, a copper pot has been provided under each fountain pipe - which was thus connected to with the water supply only through the pot. Water first fills the pot and then only rises simultaneously in the fountains. The fountains are thus controlled by pressure in the pots and not pressure in the main pipe. As the pressure in the pots is uniformly distributed all the time, it ensures equal supply of water at the same rate in all the fountains. It is really creditable that the planner spared no efforts - belonging to art, architecture and engineering - to create a perfect production without the slightest weakness, architectural or aesthetic.The main supply of the water was however obtained through earthenware pipes. One such main was discovered under the bed of the western canal. The pipe is 9" in diameter and has been embedded in masonry at a depth of 5 feet below the level of the paved walk. It's evident that, the mughal water expert was a master of his art and successfully worked out the levels in relation to the volume of water to ensure its unobstructed supply for centuries. He anticipated no repair work and therefore made no provision for it; hence the extraordinary depth at which the pipe was sunk. The garden is irrigated by the overflowing of canals. The north-south canal has inlets of water through fountains. The east west received its water through an interconnection with the north-south canal. Thus the quarters near the canals received an adequate supply of water and could be used for growing flower plants which would not obscure the general view, while the distant quarters got a smaller supply of water and were suitable only for tall trees . 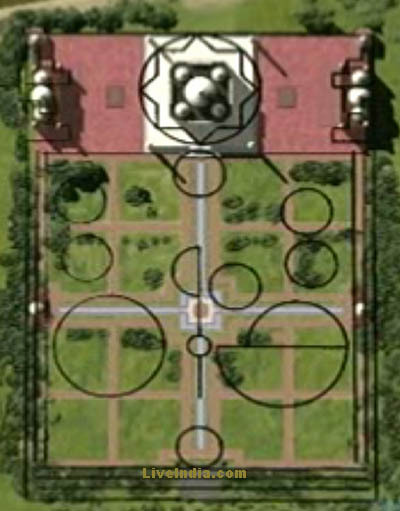 The marble mausoleum is square in plan with chamfered corners. Each facade of the tomb is composed of a grand iwan framed by bands of calligraphy. The doorways inside these iwans are also adorned with calligraphy. The iwan is flanked on both sides by small double arches one over the other. They are rectangular while the arched alcoves of equal size at the angles of the tomb are semi-octagonal. Each section in the facade is well debarked on both sides by attached pilasters which rising from the plinth level of the tomb rise above the frieze and are crowned by beautiful pinnacles with lotus buds and finials. The pinnacles add sparkle to the superstructure and help along with the other features to break the skyline gracefully. 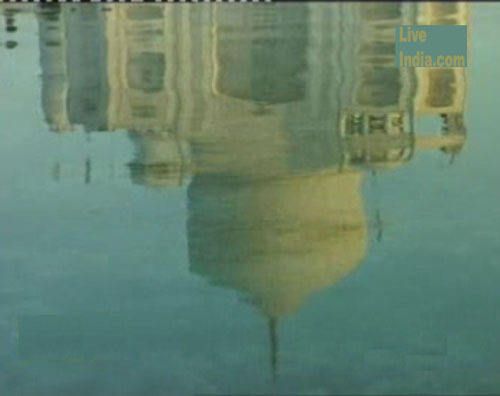 A bulbous white double dome majestically crowns the Taj. The huge dome emphasises the monumentality of the structure as its pear shaped form sits on a tall drum. The height from the base of the drum to the top of the finial is almost 145 ft. (44 m.). The double domes fulfil various purposes. Besides providing a suitable and proportionate ceiling to the interior hall, it enabled the builder to raise the height of the outer dome as much as he wanted in order to present a lofty and imposing effect. The space within the two domes is hollow and the inner cell reduces the weight of the dome. Four small kiosks clustered around the dome reduce the extremity of the vertical emphasis. 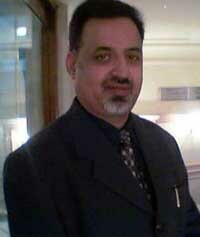 Was the main architect of Taj, an Italian jeweler named Geronimo Veroneo? Though the claim was never proved, but it certainly created a lot of controversies. The claim has been mostly advocated by the European writers though there is not much in support of this theory in India. 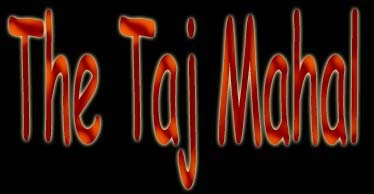 According to the story, unwilling to allow the native artisans all the credit for excellence in creating the most magnificent building in the world, Father Manrique in 1641 advanced the preposterous claim of the Italian jeweler Geronimo Veroneo as architect of Taj Mahal. Father Manrique was an Augustinian Friar who came to Lahore for the release of one Father Antony who was captured by the Mughals. And yes, there was an Italian jeweler by the name of Geronimo Veroneo, who lived in Agra for some time. On a platform 22' high and 313' square.Corner minarets 137' tall. 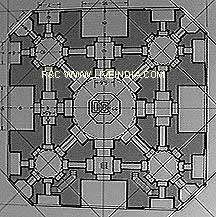 Main structure 186' on a side, dome to 187'.The mausoleum is 57 m (190 ft) square in plan. "The central inner dome is 24.5m (81 ft) high and 17.7 m (58 ft) in diameter, but is surmounted by an outer shell nearly 61 m (200 ft) in height."